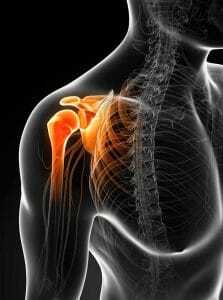 Some of conditions causing shoulder pain. We strictly advise to take expert opinion on diagnosis & treatment. Cervical radiculopathy is the clinical description of pain and/or neurological symptoms resulting from any type of condition that irritates a nerve in the cervical spine (neck). When any nerve root in the cervical spine is irritated through compression or inflammation, symptoms of pain, tingling, numbness, and/or weakness can radiate anywhere along that nerve’s pathway into the shoulder, arm, and/or hand. A cervical disc is herniated when its jelly-like inner layer, the nucleus pulposus, leaks out through a tear in the disc’s protective outer layer. This could result from an injury or aging.A herniated disc may press against or pinch a cervical nerve, or the inflammatory proteins of the nucleus pulposus may come close enough to a nerve to cause irritation. Shoulder impingement is a very common cause of shoulder pain, where a tendon (band of tissue) inside your shoulder rubs or catches on nearby tissue and bone as you lift your arm. It affects the rotator cuff tendon, which is the rubbery tissue that connects the muscles around your shoulder joint to the top of your arm. An impinging shoulder will often improve in a few weeks or months, especially with the right type of shoulder exercises, but occasionally it can be an ongoing problem and a few people may need surgery. Tennis elbow, or lateral epicondylitis, is a painful condition of the elbow caused by overuse. Not surprisingly, playing tennis or other racquet sports can cause this condition. However, several other sports and activities can also put you at risk. Tennis elbow is an inflammation of the tendons that join the forearm muscles on the outside of the elbow. The forearm muscles and tendons become damaged from overuse — repeating the same motions again and again. This leads to pain and tenderness on the outside of the elbow. Carpal tunnel syndrome is a condition that causes numbness, tingling and other symptoms in the hand and arm. Carpal tunnel syndrome is caused by a compressed nerve in the carpal tunnel, a narrow passageway on the palm side of your wrist.The anatomy of your wrist, health problems and possibly repetitive hand motions can contribute to carpal tunnel syndrome.Proper treatment usually relieves the tingling and numbness and restores wrist and hand function. Consult Spinomax Pain & spine Center to find best shoulder pain treatment for you.